We stumbled upon the Preston Fresh Seafood Wholesaler on our drive to Yorkeys Knob which is a quick five minute drive from our home in Trinity Beach. With many more items I like to try, we'll surely be returning soon. While making dinner last night I was apprehensive for two reasons; one, Tom doesn't like fish and two, it was the first time I was making Barramundi, a locally caught fish, popular in Australian restaurants which we mentioned on the day we visited the pier in Palm Cove. Their colorful signs in the somewhat remote location made it easier to spot from the highway. ﻿With my forgiving taste buds I had no fear that I'd like the fish. Tom, on the other hand, is picky and normally won't eat fish let alone a wide array of other foods and vegetables making cooking for him challenging at times. As a result, its not unusual for me to make two separate meals to allow myself variety and to try new foods befitting my way of eating. Yesterday, I'd offered to make Tom a steak and give him a small piece of fish to try but he insisted he'd give the fish a try. When we arrived at the wholesale fish market we were intrigued with what could possibly be "cooked bugs." Could this possibly be some type of sea "insect?" Check out the photo below of "cooked bugs." Usually, for myself, I'd grill fish instead of sautéing, it with garlic, spices, butter and olive oil. I knew Tom wouldn't like it grilled. Last night I prepared a bowl of beaten egg with cream and a plate of seasoned almond flour, dipping the fish into the creamy egg mixture and then into the almond flour. I preheated the only skillet in this house with an equal mix of coconut oil and olive oil in a medium sized non-stick type which I wouldn't normally use if stainless steel was available, keeping it from getting too hot due to the pan's coating. Gee...we've never seen scallops in the shell. We can imagine a plate of six of these covered in an almond flour and Parmesan crusted buttery topping. Tom likes scallops so this will be a no brainer. The fish was so thick, it took a good 12 minutes, turning it once to ensure it was cooked thoroughly but not overcooked. Without a lid for the pan, it had to cook longer than usual while I kept a watchful eye. Finally, I plated our meals and we sat down to dinner at the dining room table. I tried not to watch Tom's face as he took the first bite, instead focusing on my own delicious plate of food. The fish was mild, cooked perfectly without a single bone to be found. These are "large cooked bugs" which are similar to crab but according to the sales person, they taste similar to prawns. Next time we visit, we'll try a few of these. After his plate was clean, he turned to me and said, "It was OK." Oh. What an enthusiastic response. Then again, that's a typical response for Tom or, shall I say for many men who a less inclined to "jump for joy" than us more enthusiastic women. Sorry women, for the stereotyping but men are different than us, aren't they? Will I make this for him again while we're in Australia? Most likely not. I was grateful he tried it once. And, if I make it for me, most likely I'd grill it to avoid making such a mess on the stove top especially when the oil spattered when I turned the fish with a less than ideal spatula and hot grease hit the stove top and a few spots on my hand. No big deal. We selected a filet from this batch. Keep in mind, for those of you reading from countries not using the metric system...AUD $32.50 per kilo translates to 2.2 pounds which would be USD $14.77 per pound, not too bad for fresh (never frozen) wild caught fish. We purchase about one pound of which Tom had 9 ounces and I had approximately 7 ounces. As for the smoked fish shown in the photo, this morning we had scrambled eggs with cheese, bacon and smoked fish on the side. What a perfect way to start the day! Recently Tom has been having two meals a day, with me having one meal plus and an occasional light breakfast or afternoon snack. Due to my strict way of eating, a ketogenic diet, I have little appetite until dinnertime. At AUD $64, USD $49.26, all of these items which includes a huge Barramundi filet, two pieces of made-without-sugar smoked fish and two containers of crab meat which we'll use to make low carb crab cakes this weekend (lasting for two meals) will result in four meals for the two of us. As a result the cost per entre results in a cost per day of AUD $16, USD $12.31, not bad for such delicious fish and seafood. We struggle to be motivated to go out to dine when we do so well at home and have just as good a time. Yesterday, we headed out for our weekly trip to the grocery store which now entails a trip to Woolworth, the meat market and the indoor vegetable stand (they call it "veg" here in Australia). Tom waited in the car while I shopped reading a book on the Kindle app on his phone. I wasn't gone more than 40 minutes, now that I've become familiar with the market. There were a few types of fish that had been frozen but it was clearly marked. We don't purchase defrosted fish preferring to buy only fresh when available. Luckily, the other shops are outside the door of Woolworth in the mall making accessing the other stops easy and convenient as I wheeled around the "trolley" that had an annoying wheel with a mind of it's own. Making my way to the car was challenging when I had a hard time with the crazy cart while attempting to maneuver the speed bumps (sleeping policemen). Last night's dinner of lightly battered with egg and almond flour, sautéed in coconut and olive oil Barramundi, fresh organic green beans, homemade LC muffin and salad on the side was a perfect meal we both enjoyed. Today, we're off to a local travel agency, again in the Smithfield Mall, to arrange a few upcoming flights. Normally, we don't use travel agencies but with the high cost of data using the SIM card why not let someone else do the looking when it won't cost us any more using a travel agent? Many more fabulous scenery photos are stacking up which we look forward to sharing each day. With the summer season in Madeira roses were blooming in almost every yard in the neighborhood. For details from that date, please click here. After leaving the beach we drove to a high point in the area with this expansive view. The Cairns area of Queensland has so much to offer, its highly unlikely we'll ever run out of places to explore during our remaining few months in Trinity Beach. Sure, at some point we'll drive further away. For now, we're soaking in everything we can in the wide area surrounding us that is jammed packed with interesting spots to visit. We walked past a grove of palm trees and evergreens as we made our way to the beach. Yesterday's outing after my workout was no exception. Having heard about Yorkeys Knob as a community rich in history and diversity, we decided to check it out and by no means were we disappointed. As we walked toward this crest which after crossing dipped down to the beach, wondering if any crocs may be lying in wait. We found an enormous stretch of beach that was pure paradise. We met people along the beach with whom we talked for some time, we drove along the many streets and beach boulevard enjoying the differences of other beach roads we'd seen thus far. We gathered shells on the beach which we'll share in photos soon. Yorkeys Beach was serene and pristine. And, much to our delight, we purchased fish and seafood at fabulous wholesale fish warehouse on the remote drive back to Trinity Beach. We timed the return drive from the fish market to our house to discover its a mere five minutes away. Of course, we'll return in the future. At certain points, it felt more like the desert than the beach with various vegetation shooting up through the sand. That five minute drive confirmed how close we actually are to getting away from the more populated, somewhat traffic congested areas in the popular Trinity Beach. This view was to our left as we faced the ocean. Its the unexpected experiences that we stumble upon that makes our travels all the more exciting, those we'd never know about had we not driven to an area that may not particularly be on "tourist's radar." Visiting many of the typical tourist venues may not appeal to us due to the commercialism, impatient crowds, excess fees for entry and of course, the long lines. To our right, this was the view we stumbled upon. Nothing about yesterday's outing reminded us of the above. Quiet, uncrowded, vast expanses of unspoiled beaches brought us the kind of joy that makes our travels meaningful and memorable. We spoke with this woman who is from Sydney and travels throughout the continent with her husband in their "caravan." She, like us, was enthralled with the number of shells on the beach, not often found on many beaches that we've walked throughout the world. "Behind the naming of any village, township, city, state or country lies a story. Some names are bland, negating any curiosity to pursue the derivation. Conversely, names can be provocative instantly stirring the imagination. Yorkeys Knob on the eastern coast of Australia in the northern part of the State of Queensland is such a name. Westing from the Coral Sea - approaching land from the east, Yorkeys Knob sits very prettily on the hem of the great Barrier Reef. To further enhance a natural beauty it edges into rich coastal flatland running from the foot of a marvellous range straight into the illimitable sea. The Knob itself is the first headland north of the Harbour of Cairns, a cheeky headland layered in rock with a fuzz of timber. Its boulders tumble into the sea in arrow fashion forming a calm bay on its northern side and giving the surf full play to the south. The bay is called Half Moon Bay because of its crescent-shaped white beach and cradles a tidal river running up to and fed by the massive range. On earth level at any angle or off-shore, the lumpy and picturesque Knob invites an explanation why a man nicknamed Yorkey gave to this Knob a meaning. It might be assumed that amongst the cosmopolitan insurgence of gold-diggers into Northern Australia during the mid-1800's was a Yorkshireman called George Lawson. There is no factual information to support this assumption. It was only in the 1880's that an adventurous hard-living beche-de-mer fisherman nicknamed `Yorkie' was, by a series of incidents emerging as an identity in the northern waters off the harbour of Cairns. On 10th May 1883 issued the first copy of a newspaper "The Cairns Post". Thereafter this newspaper was published weekly until 1888 then bi-weekly until 1893. Despite disruptions, changes and upheavals to this date, the newspaper flourishes on a daily circulation. But it is to its romantic and uncertain first decade that we owe a faithful recording of time, date and incident relevant to the man George Lawson nicknamed Yorkie. In early records Yorkey is referred to as `Yorkie' or 'Yorky' and in one instance as being a Norwegian fisherman who lived on the 'hill' called the Knob. However, in all traceable registers the man Yorkey and the headland Yorkeys Knob rise unmistakably and territorially rock-like from misty legends of an extensive region strongly linked to the sea. The same registers disclose the man Yorkey's great respect for life in a time of lust and survival, more impressive when human life weighed little in value." Today, we're sharing some of our photos from yesterday's visit to Yorkeys Knob and more will follow in days to come. And tomorrow, we'll be back with photos and the "steal" we got on the seafood we purchased. Another view of the barren beach. A few days ago, when we posted photos of the pier in Palm Cove and the limitations on fishing for the popular local fish, Barrimundi, we were intrigued by this fish. We drove up the hills toward this resort, a distance from which we shot today's main photo, looking back down at the beach. As it turned out, we were able to purchase a fresh caught over .5 kilo, 1.1 pound, Barrimundi filet which we're having for tonight's dinner, dipped in egg and dusted in almond flour to be sautéed in grass fed butter and locally made extra virgin olive oil. We met this sweet puppy , Abby, on the beach as her parents took her for a walk without a leash. She playfully jumped up and down in the sand. Of course, we'll take photos of tonight's dinner and share them tomorrow with our opinion on the firm fleshy fish. Even Tom, who doesn't usually eat fish, agreed to give it a try. Tiny wildflower growing on the beach. Thanks for stopping by! We always appreciate your readership. Unsure of why the village of Campanario was decorated and with the language barrier we could only guess at the purpose of the whoopla that many residents were busy preparing. As it turned out, it was a church festival that lit up the village that night. For more details from that date, please click here. A pretty restaurant on a corner. Today, we include more of our photos from the Palm Cove Beach area as we explain a little information about the Australian continent. The sidewalk along the beach in Palm Cove. As we read more and more about Australia, we discover that it is one of the most ethnically diverse societies in the world. Not unlike many countries, many of its people were born outside the country. Many of the restaurants offer Italian cuisine. According to recent records, one in four Australian residents were born outside the continent with many more being first or second generation many of which are the children and grandchildren of immigrants who arrived in this past several decades. Prices at many of these resorts are surprisingly reasonable, such as at Mantra Amphora, as low as AUD $179, USD $136.47 for each of a three night stay. With diverse backgrounds and culture of indigenous Australians who have lived on the continent for more than 50,00 years have been highly instrumental in developing a unique Australian spirit. There were diners enjoying an early lunch as we explored the area. In 1778, before the arrival and onset of the British colonies, Australia was inhabited by its indigenous people, the Aboriginal people. The Torres Strait Islanders inhabited the island between Australia and Papua New Guinea, now named the Torres Strait. Casual, affordable dining establishments line the boulevard. At one time there were over 500 varying clans or nations throughout the continent encompassing many unique and distinct cultures, languages and beliefs. Indigenous people make up 2.4% of the total of Australia which is approximately 460,000 out of a total of 22 million people. Another exquisite resort in Palm Cove Beach, Oasis. If we were coming to this area for a typical two week vacation, this particular area would be an excellent place to stay especially at any of these resorts. The state of New South Wales was originally settled as a penal colony where Britain sent convicted criminals with their own prisons over populated. Many were sent to the far away prison for minor offenses but the conditions in the new colony were improved over that in Britain although disease and malnutrition were widespread during the first decades of the settlement. Pizza restaurants are never at a shortage in most countries we visit. The first migrants to choose to settle in Australian included men of certain financial status who were interested in the colony's agricultural opportunities with the availability of convict labor. There are apartments and condos atop some of the shops and restaurants. Alamanda at Palm Cove, an resort along Williams Esplanade. Those settlers in Australia in the 19th century lived at the forefront of a new society in their new land. There's never a shortage of pharmacies wherever we may travel. They are often referred to as "chemists" in many countries. Our experiences on the recent cruise with 1400 Australians who excitedly share their history and their opinions on the politics, growth and diversity of their country gave us an inside perspective of the general views of many of the people of Australia. A small grocer and "take away" food in this strip of shops. Also, each day, during our quiet time, we have an opportunity to watch Australian news from many parts of the continent. One aspects rings true for us in our experience, however short and limited, that the Australian people have a commitment and love of their country and a willingness to share their thoughts and opinions on the future growth and development of their country in a manner we've found to be both dedicated and far reaching into the future. Palm Cove Holiday Park is across the street from the beach. We'll be sharing more on the history and diversity of the Australia and its people in future posts. Its easy for us to enter an entirely new country with our preconceived notions as to its history and its people. Its especially meaningful to discover otherwise. Today, we're off to the fitness center and then exploring more of this fabulous area in Queensland. Have a fabulous new day of your life! Ironically, it was one year ago today that we booked our current location in Trinity Beach, Australia and posted the photos and information. We couldn't be more pleased with this property, the views and the thoughtful owners. For more details, please click here. This was one of our favorite spots located on William Esplanade in Palm Cove Beach due to the colors reminding us of the village in Placencia, Belize from so long ago. With a 65 day gap to fill one year from today, we're chomping at the bit to fill this spot with somewhere we'd love to visit. It isn't as simple as it may seem. Our proximity at the time is a huge factor. We'll be at the fabulous house in Bali located in a lovely area for 59 days (visa restrictions) to be returning two months later for two more months. We were provided an excellent price for our two separate stays and loved the property so much, we couldn't resist the two separate visits. The Palm Cove Beach Club. In Australia, many accommodations and parking spot are made available for disabled visitors as shown in this parking spot. At the time when we checked flights and vacation rentals in and out of Bali, we didn't think we'd have an trouble finding a place to stay. Per our previous philosophy of advance planning as much as two years out, we now realize that waiting may have been to our detriment. With the slow wifi here in the house, which Tom uses and the cost of the SIM card I'm using, searching is costly and time consuming. My connection is excellent with the SIM card but I can easily use one gigabyte a day at a cost of AUD $8.74, USD $6.69 per day. Spas and beauty shops also were readily available in the area. This amount is less than our monthly cable bill in our old lives, less than a flavored coffee at Starbucks or a single cocktail in a bar comparable to a daily use of one gig. In this context, it doesn't seem like so much after all, especially when we have so few other expenses; car, fuel, rent, food, health club and occasional entertainment. Today, we'll continue the search which now over the past year will have changed in a very important manner; locations we may have considered in the past are now less safe to visit for obvious reasons we see daily in the world news. Of course, we all know that there is no country or island in the world that is exempt from these horrific possibilities. Palm Cove area wasn't developed until 1986, making most of these venues less than 30 years old. Caution will always prevail in our lives but our sense of adventure and desire to see many parts of the world will also play a big role in where we decide to go. After all, we've already been to many of the areas that we wouldn't visit now as war and strife has escalated in the past few years. We continue to review warnings from the US Department of State Travel information that we take seriously. There were some apartments and permanent residences along the esplanade. Let's face it. We'll always make mistakes in our planning. In essence, we probably shouldn't have booked the second stay in Bali. But, now we're committed after paying a substantial deposit which we'd forfeit if we cancelled. There were a number of resorts and hotels interspersed among the row of restaurant along the beach boulevard. Did we learn a lesson? Of course we did. Its the same lesson we learned in staying in Kauai for over four months. Did we have a great time? Yes! Better than ever expected. But, without a doubt, it was too long. Ironically, we booked Bali for this extended period over a year ago. We've learned a lot in this past year and we continue to discover more and more as to what works for us as we continue on. The restaurants were varied in their ethnicity and styles of food. At no point will we ever say we have it all figured out. With the world changing around us, we continually adapt and change accordingly. Also, with more and more experience we discover circumstances that appeal to our wants and needs. These two side by side restaurants have thick vinyl windows to protect the diners on windy and rainy days and nights. We aren't putting ourselves in a position of urgency in selecting how we'll choose to fill this gap. In looking at a map, the options are plentiful. In considering our budget, the options dramatically change. We accept the possibility that filling this gap may ultimately cost more than we'd hoped. Once we fill this spot, we'll certainly share the details and costs here, not hesitating for a moment to share the reality of having to spend more than we intended. Its all a part of the reality of our lives. The Williams Esplanade in Palm Cove has one restaurant after another. We have certain criteria and expectations which include a quality place to live, in a good neighborhood, a living room with a good sofa, with interesting views, wifi (if possible), a full kitchen and on site laundry facilities. We don't like typical apartments in a big city which if we can avoid we will. Don't hold us to this. We may have to change our minds as time marches on. A number of shops occupied this small shopping center along the boulevard. Its Sunday here in sunny Australia. We plan to stay "home" today, spend time on the veranda, make a nice Sunday dinner and get back to work on the search to fill the gap. We hope your day is filled with sunshine! 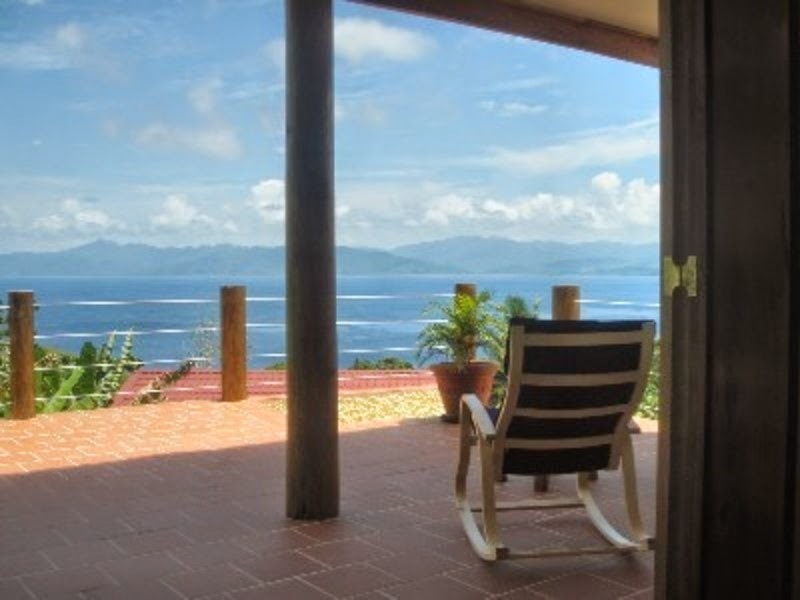 Veranda view from our upcoming home in Fiji where we'll be living in a little over two months. We'd booked Fiji a year ago today. For more details, please click here. One of many quaint outdoor/indoor restaurants along Williams Esplanade In Palm Cove beach. More photos of the boulevard will follow tomorrow. Midday yesterday after my stint at the fitness center, we decided to drive until we found more amazing scenery we'd yet to see. It wasn't a difficult task to accomplish as we headed north on the Captain Cook Highway, beyond a point which we'd driven in the past. A boat launch near the Palm Cove pier. The beach with a few adventurous sunbathers. At a long distance from our area, we'd seen a pier that peaked our curiosity. After asking Sylvie and Andy about it, they suggested it was definitely worth a visit. When the sun peeked through the clouds, the views were especially appealing. We couldn't have been more pleased after we turned east down the road we'd guessed it might be to find the beautiful Palm Cove, a fabulous beach and resort area with restaurant lined streets, shops and tourist attractions. The pier had been designed with various levels to allow those fishing to be out of the way of the walking visitors. Surprisingly, on a busy Friday, we managed to snag a parking spot and were able to walk up and down the beach along Williams Esplanade soaking in all the quaint and interesting buildings. The view of Palm Cove beach from the pier. Too close to the buildings and with the street crowded with tourists it was difficult to take good photos from the sidewalk. After our walk, we slowly drove along the boulevard enabling us to get some decent shots to share here over the next few days. Notice the white plastic holders on the posts. These holders are for the purpose of holding the fishing rods while those fishing can take a break from holding their rod. The walk on the pier was pleasant on a sunny day and we were able to watch fishing enthusiasts avidly perusing a fine catch of the day. In our old lives, we enjoyed fishing but now without equipment of our own and prohibitive costs to buy or rent equipment, its not something we need to do. The long, fairly wide pier is a commonly visited spot for tourists. The pier was packed with tourists armed with cameras, like us, along with families and kids enjoying the beautiful, albeit windy day. There were a few sunbathers lounging on the beach and a few in the water, oblivious to the danger signs posted everywhere in regard to the stingers and crocodiles. A brave kayaker in the ocean with sharks, stingers and crocs in these waters. "The history of Palm Cove dates back to over 60,000 years ago when the Aborigines became the first settlers. The most famous landing at Palm Cove happened in 1873 when G.E. Dalrymple’s Northeast Coast Expedition landed to explore the beach. The expedition was met with hostility by the indigenous people and they opened a violent assault on the exploring crew which led to one of the largest beachfront invasions in Australian history. Shortly before World War I in 1918, the land that is today Palm Cove was bought by Albert Veivers from Archdeacon Campbell. Archdeacon Campbell had been known as a priest at Cairns church who experimented with bringing different agricultural crops to the Cairns region. Veivers was important in the advancement of Palm Cove by having the first road built. The creation of the road led property values in Palm Cove to increase dramatically, leading to more prosperity for the community. Shortly after World War II, in which Palm Cove was used as a training base for Australian soldiers, the number of people traveling to Palm Cove greatly increased. The opening of the Ramada Reef Resort in 1986 marked the first international hotel chain to be located in Palm Cove and the town has continued to increase in national and international recognition ever since. Palm Cove is located in Far North Queensland and is on the coast of Australia. It is guarded from the South Pacific Ocean by the Great Barrier Reef. Palm Cove is completely surrounded by the Daintree Tropical Rainforest and is close to Daintree National Park. Since Palm Cove is located in a tropical climate, the average summer temperature is between 24 and 33 degrees Celsius; average winter temperature is between 14 and 26 degrees Celsius." On our walk back to the beach. Palm Cove proved to be an interesting and enjoyable spot for us to visit. Later, on our return drive to Trinity Beach we discussed how different our lives may be than for those of tourists. Most tourists visiting this area would have stopped for a meal and/or drinks in one of the many dining establishments along the way. Catching Tom off guard on the Palm Cove pier. Instead, we read and take photos of the posted menus for the restaurants we may return to down the road when the mood hits us. Dining out is less enjoyable for us when my restricted way of eating makes doing so complicated at many restaurants. But, we're not complaining. The sand on the beach in Palm Cove is known not to be as fine a sand as other beaches in the area. Checking out the various locations is satisfying enough for us. Its just not worth my ordering a steak for AUD $35, USD $26.80 when its being cooked on a grill where foods with gluten, starch or sugar may have been cooked. We can easily purchase and cook fabulous grass fed steaks for AUD $15, USD $11.49 each, with side dished we know I can have. The sixth fish down in the left column on this list is the popular local Barramundi Cod, often found on menus in local restaurants. Apparently, according to this list (see photo below), the sign says, "No take," perhaps indicating they cannot be kept if caught. Barramundi Cod as indicated on fish identification sign in the above photo. Neither of us feels any resentment even in the slightest manner by the virtue of the fact that, "Hey...we're traveling the world and we're healthy. What more could we ask for? Nothing, absolutely nothing! 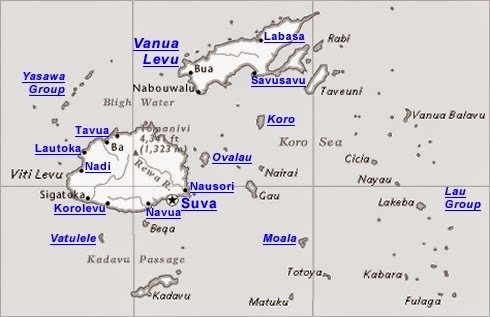 Ironically, it was one year ago that we booked our next location in our travels in Savusavu, Fiji as shown in the map of the smaller island in Fiji. For more details, please click here.